In this new episode of Ostium, the happy couple talk about their happy night together and then go through a new door and find themselves in what looks to be a rocky desert. This episode was written and produced by Alex C. Telander. The voice of Jake is performed by Chris Fletcher; the voice of Monica is performed by Georgia Mackenzie. All the music was composed by Chris Fletcher. Graphic design and artwork is done by Sara Warren. Sound effects are courtesy of the awesomely incredible people at the Freesound Project. 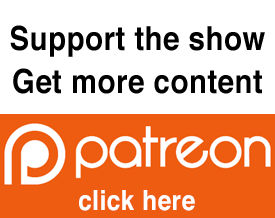 Ostium will continue to be ad free thanks to our great and wonderful patrons who support the show through our website, or through our Patreon page. Why not consider becoming a supporter of our show? For as little as $2 a month you can get access to exclusive mini episodes, including something called The Ostium Files. It’s a series playing around with the idea of what if you could go through an Ostium door to the time and place of you’re choosing . . . Where would you go? There are also lots of other rewards like episode transcripts with illustrations, music, and special early access to new episodes of Ostium. Plus if we hit our support goals, you’ll get access to Ostium Season 3 MUCH sooner. If we hit our top goal, Season 3 will start right after Season 2, without any break. So check it out at www.patreon.com/ostiumpodcast. Whatever you can spare will be greatly appreciated and means so much to us. You can also support Ostium by leaving us a review on the podcast listening app of your choice, or simply by telling your friends, or mentioning how much you enjoy this podcast on social media. And of course, there’s also our merchandise store with a whole variety of goodies likes mugs, t-shirts and even fancy pillow cases, all at www.ostiumpodcast.com/store. Also if you’re looking for a good book to read, “Ostium Book One: Population Zero” is out now on Amazon in ebook, paperback, and a fancy full-color illustrated edition. This week’s podcast recommendation is Duggan Hill: On a back country road outside the hamlet of Duggan Hill, Saskatchewan, a woman named Sasha Ismond goes missing without a trace. She had been travelling from Vancouver for the past day, and was mere minutes away from her father’s home. The last person she spoke to was her former partner, Zoe, a journalism student at the University of British Columbia. This is a collection of recovered audio recordings from the subsequent investigation into her disappearance, recorded during the summer of 2015. Similar to Rose Drive, Duggan Hill is a growing mystery that at first you want to know what exactly happened to Sasha, but as the mystery grows, you start to wondering what the exactly the hell is going on in this strange town. Finally, thanks for listening. Without you, there wouldn’t be any point in doing this podcast. So thank you and see you in two weeks with Episode 17: Rapa Nui.